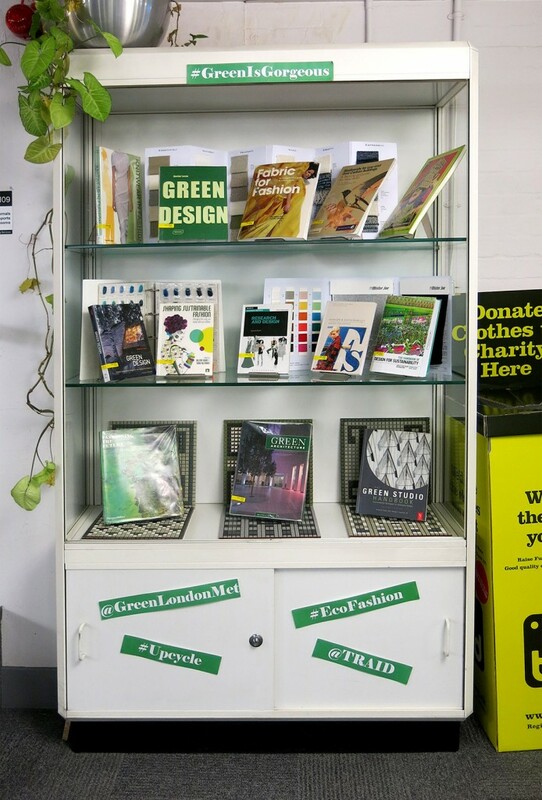 Aldgate library has been helping to promote Green London Met with a display of ‘green’ related books, including green design and eco fashion, and also some materials from the materials and products library made from sustainable material. For those who have visited the library you know we love our plants and greenery and one has made its way to complement the display. London Metropolitan University is committed to continuing to reduce our environmental impact and to use resources in an environmentally sustainable and responsible way. November was waste and recycling month, and December is energy month. You can also find in the library a box to recycle your batteries and a clothes recycling box from Traid. There are plenty of recycling bins scattered around as well, so plenty of opportunity to help out and recycle what you can. This entry was posted in Library books, Library Collections, Library news, Uncategorized and tagged "graphic design", "interior design", architecture, design, fashion, green, materials, textiles. Bookmark the permalink.